Witch bottles date back to at least the 17th century and were used as a protection against witches. The tradition comes from England, but examples have been found during the excavation of colonial American sites. These innocuous glass bottles or clay jars were filled with an assortment of magical countermeasures, including the urine, hair, and nail clippings of the person needing protection. Later, rosemary (a warding herb known since Roman times), needles, and wine were included as well as sea water, dirt, stones, knotted threads, feathers, salt... Frankly, the list goes on. If it has a magical connection, it was probably tossed in. 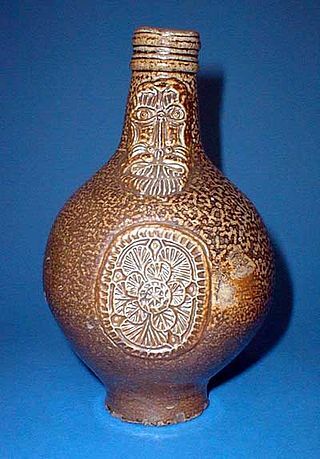 Some early examples were a simple stoneware, glazed with salt, and embossed with the visage of a bearded man. These bottles were secreted away within the walls of the house, beneath its hearth, or buried at the edge of the property. Some were tossed into a fire to break the spell focused on its owner.